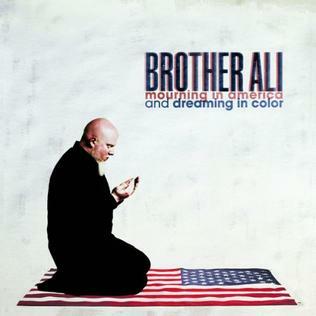 Now, the first time I heard of Brother Ali is when I was at Soundset in May and he was the host. I’d never heard any of his music, and I didn’t know his history at all. As many of you know, I listen to a lot of music, and at that time, I was still getting familiar with different regions and their music. The Midwest Hip Hop scene is more than just Chicago & Detroit, but it’s because that the bigger names come out of there that the other cities like Minneapolis & Kansas City don’t get a lot of love. Minnesota has a hip hop scene, and it’s very underground & independent. It’s primarily white rappers that are in that area (not like it matters), and their content is different from the other major regions of the States, so it’s good that they have their own identity, but no one really knows about it. Brother Ali is just one of those rappers that is making a name for himself on a bigger stage, but he’s been in the game for a while from what I’ve researched. This would be his 5th album since 2000 and the 3rd to be on the charts, so he’s making his ascent in the Hip Hop world with every project. What he raps about, I could compare him to Lupe Fiasco, but not in the sense that he has the same vivid wordplay as Lupe, but the way that they’re both adamant about being vocal about the government and basically what they see in their surroundings that’s pretty messed up. Speaking for the people who have no voices to do so – hence why Rappers are doing what they do in the first place (well…sometimes). This album, after giving it a few listens, features content that I just explained in the previous paragraph. It’s geared towards a working class society that talks about the divide between the rich and the poor in America. The economy is a big issue in the States, as it is in almost every country, but it’s really an issue in the States, and it has been for years. Another issue that he touches on is the music industry and that not enough rappers are putting out that good truthful music that people need to hear, but let’s be for real, I love a good message here and there, but you have to mix it up. That’s just me, but I still have love for rappers with their own style. As much as I respect the fact that he’s a positive rapper and he came on this record to talk about the issues that many can relate to, the feel of it to me wasn’t all that moving. I look at this album, and then I look at Lupe Fiasco’s F&L 2. Two albums that have similar messages, but they’re polarizing in execution. The difference is, I didn’t have any expectations for MIADIC because I’d only heard like 2 Brother Ali songs before, so I was blind (no pun intended – Brother Ali is legally blind) to his music (I guess ‘deaf’ would have been the better word to use). His lyrics are direct and to the point, no bullshitting around, but the overall feel that I had for this album was boredom. Not in the sense that he wasn’t saying anything interesting, but through the quality of production, the beats were smooth, but they were plain. A lot of the songs felt the same, and like I said, I had no expectations, but for me it didn’t hit.